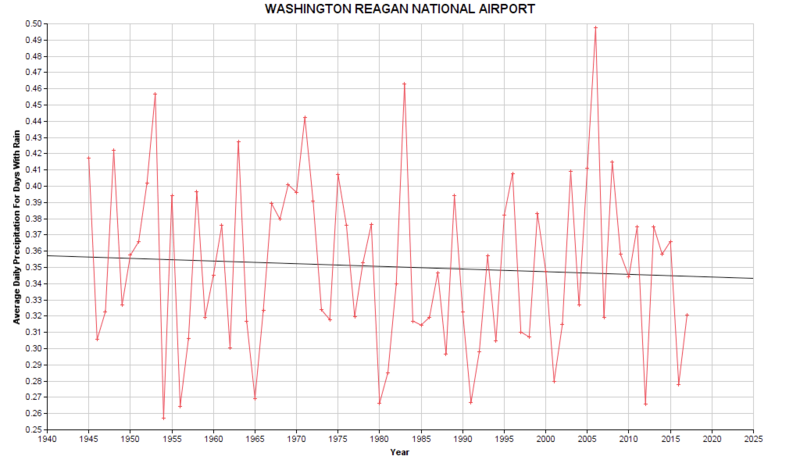 Recently the weather, at least precipitation wise, in the DCA area has been variable. It was very wet and rainy, then we had dry conditions for several weeks with essentially no rain. Now, it is very wet again. 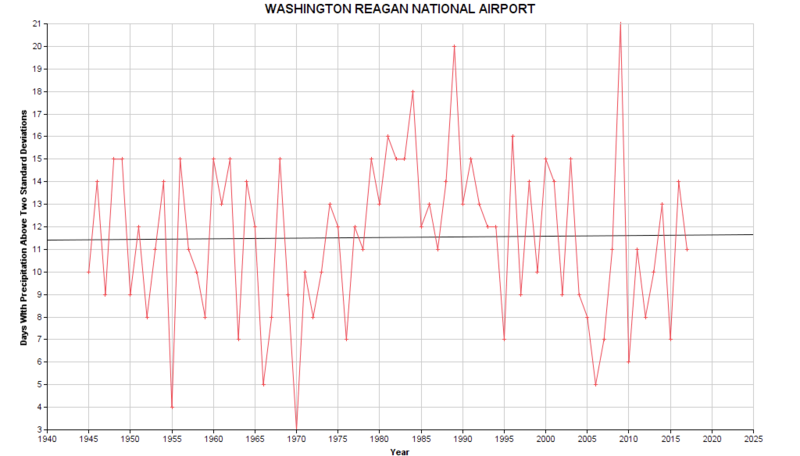 Are we seeing extreme (some may say historic) changes in the weather? Or are these just the usual variations? Are rainfall events are becoming less common, but more extreme? That is, it rains less often, but we get more rain when it does rain, rather than getting rainfall spread out evenly over time as it used to be. And maybe we’re getting more rain overall. Or possibly less rain, those two claims seems to depend on recent weather memory. The dataset runs from July 1, 1945 to July 18, 2018. There appear to be a few days with missing data, as for some years there is only data for 364 days. The actual number of days per year of data was taken into account when computing means. Also, some data is not plotted for 1945 or 2018, namely the number of days with/without rain for those years, as a full year of data is not available. Each of the graphs can be clicked to be viewed full size. 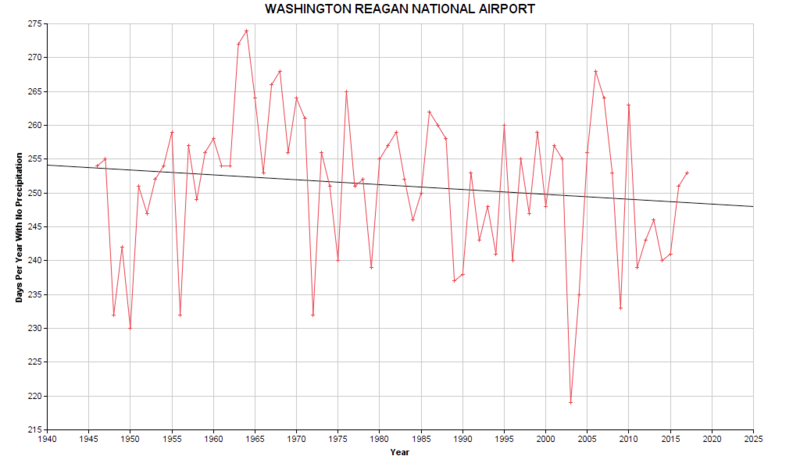 OK, maybe it is mostly the same, but we’re getting a few more extreme rainfall events per year? Let’s look at the standard deviation of the rainfall amounts, again only for days when it actually rains. 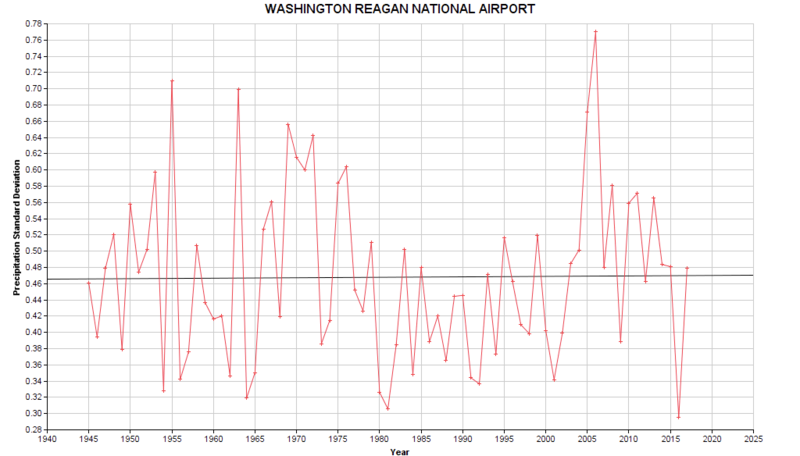 Anything else we can check to see if precipitation is indeed getting more extreme in Washington DC? So far, it doesn’t seem to be. Note, the purpose of this analysis was not to try and discredit man made climate change aka AGW, which is certainly real. Only to see if claims of a noticeable effect on the precipitation patterns in the DC area can be confirmed, which does not seem to be the case. This entry was posted in Weather by Chris Smolinski. Bookmark the permalink. Nice analysis… Maybe take the top 3 (or 1 or 5, but I think the top 3 may work best) most extreme rain events each year, add them up. Then graph that sum for each year. 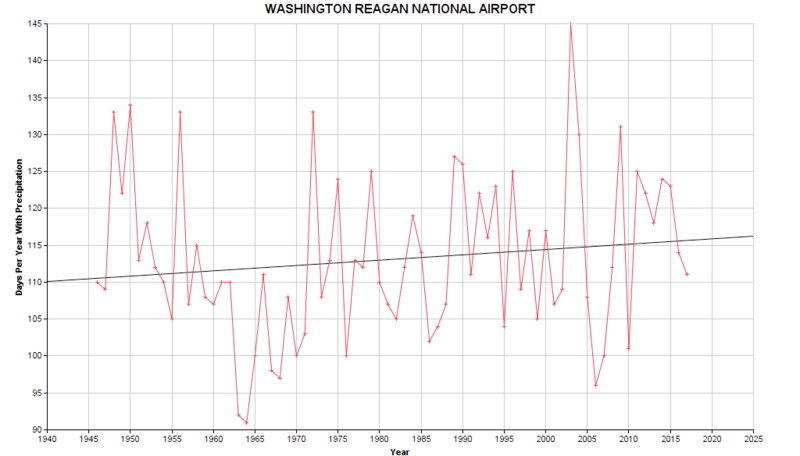 To see if the top 3 rain events each year have a rising trend. Based on the standard deviation graph, I’m thinking probably not. But would be another check. 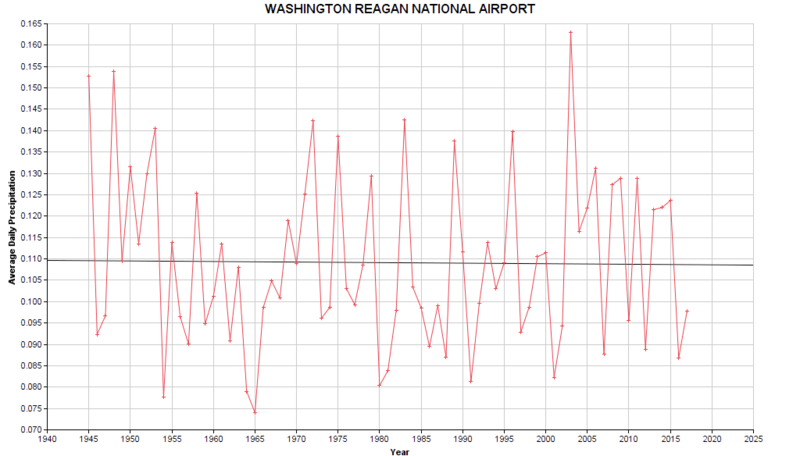 Also, perhaps repeat this for IAD and BWI and see if DCA is flat only because of the mythical “DC rain / snow hole”. Thanks for doing this and posting it, nice work!